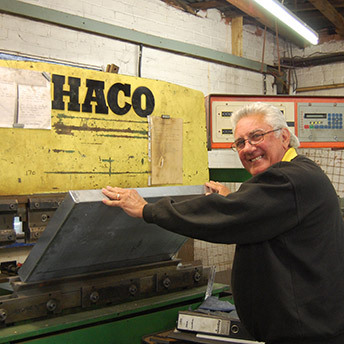 Established in 1930 by the present owner’s grandfather, Henshaw Manufacturing has produced a wide range of items from sheet metal over the years – fishing rods, bread bins, parts for motor bikes – but currently specialises in supplying janitorial items such as toilet roll and towel holders, bins, sack holders and lobby brushes to wholesalers and catalogue distributors. Being able to press, spot weld and powder coat gives the company a competitive edge, which has enabled it to continue to do well in spite of the recession. In today’s highly competitive global marketplace, however, manufacturing companies generally operate with tight margins and Henshaw Manufacturing is no exception. A leaking flat roof, a machine in need of repair and one of its biggest customers going into administration simultaneously were enough to put the business’s cashflow under strain. The company’s financial intermediary recommended contacting ART for a loan, which owner and Managing Director Roger Weeks was happy to do as the company had previously been supported by ART.